Nagarjuna was presumably born between 150-250 AD in the south of India. There are several versions of his birth and early years. According to one of them Nagarjuna was a sick child, so he was sent to a mountain monastery in order to improve his health. There, near a mountain lake, he experienced a vision of the Nagas’ king and his underwater palace. He had a vision of a Stupa, surrounded by Buddhas and Bodhisattvas. Nagarjuna opened this stupa and saw inside it another one, which was just identical to the first one. So, he decided to find the very first, original stupa. He opened the second stupa and saw inside it the third one, and inside the third one – he saw a fourth one…When he opened the fifth stupa, he found the first stupa once again. This way he had a symbolic realization of emptiness of the five skandhas. Thus, in the underwater palace of the Nagas’ king, Nagarjuna gained an understanding of the Prajnaparamita sutra, the sutra of transcendental meanings hidden more than 500 years before by the Buddha. OM, praise of the Prajnaparamita! So I heard. One day, the Blessed One was in Rajagri on Mount Kite with a great community of monks and a great Bodhisattva community. At that time, the Blessed One, having uttered the teaching, was immersed in samadhi. At that moment, Bodhisattva Avalokitesvara saw the deep meaning of Prajna Paramita and he perceived that all five skandhas are empty. Thus, he overcame all Ills and suffering. and the emptiness does not differ from form. no feelings, perceptions, volitions or consciousness. until we come to no realm of consciousness. no ending of old age and death. of the cessation of suffering, nor of the Path. There is no wisdom, and there is no attainment whatsoever. no obstruction in his mind. and he passes far beyond confused imagination. After obtaining the Prajnaparamita sutra, Nagarjuna served as a rector of the Buddhist University of Nalanda. He was known as a scientist and alchemist. He is credited with 180 works, and became the founder of the philosophical school of Madhyamika, one of the two main schools of Mahayana. Later, in his old age, Nagardjuna received an invitation from the king, who ruled in his native land to become his spiritual teacher and moved back to the south of India. The last years of his life Nagarjuna spent on Sri Parvata – the sacred mountain towering over the modern Nagarjunakonda. He taught the sacred Teaching to numerous disciples and achieved its prosperity in this area; attracted by the glory of his wisdom, disciples from all over India came to him. There is no consensus as to how long Nagarjuna lived, estimates of the duration of his life range from 150 to 600 years and his death is shrouded in legends. It is said that his body was preserved by Sri Pravatra in anticipation of the arrival of the Buddha Maitreya. It is difficult to overestimate Nagarjuna’s contribution to the development of Buddhism, perhaps his contribution is considered second in importance after the Buddha. 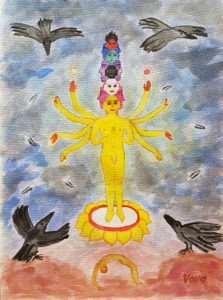 Nagarjuna reflected upon the essence of the five skandhas (five groups of attachment) and his mind developed the vision of Nagas who transmitted the teaching of Prajnaparamita to him. Nagas are illusory, magical beings, depicted as snakes. They do not participate in the process of creation, but they do participate in the process of governing the universe. The world of the Nagas goes far beyond any philosophical system. Nagas are inclined to create an order in existence. But the extent to which a new level of order will be humane depends on the people themselves. According to legend, the Nagas have supernatural wisdom and strength. Often people perceive the Nagas as susceptible and revengeful beings capable of sending misfortunes and disease (that might be a reason for hostility toward snakes). But Nagas are great beings, their minds are still, they do not seduce people. Rather, the mind approaching them feels and shows its weak points. The Nagas are a form of expanded channels. Just as it is easier for a snake to crawl through a wide passage, expansion of the body channels allows substances, liquids and energy to pass through them more easily. Therefore, the expansion of channels leads to the appearance of sensations of lightness, strength and bliss in the body. The expansion, relaxation of the human body channels can be achieved in different ways. A person will choose a path based on the inclinations of his or her mind: He may turn to the Nagas by his side that desires sensual pleasures or ask for transcendental wisdom, as Nagarjuna did. The rational meaning of Prajnaparamita is that all five groups of attachments (skandhas) are completely empty. our experience of suffering is thus completely empty and the cessation of suffering is empty. Emptiness is the construction of all phenomena; therefore, phenomena do not have their own real essence, they are impermanent, changeable and subject to suffering. Understanding of the fact that the four noble truths are empty is a culmination of the Prajnaparamita. The path of cessation of sufferings which was shown by the Buddha and developed by his followers is also empty. And because it is empty, and just because it is empty, it is able to come into contact with the empty sufferings and lead to their cessation. It is necessary to fight with enemy with the same weapon; otherwise our battle would be ineffective. In a battle with a ghost a paper sword is much more effective than an iron one, because a paper sword and a ghost are on the same “wave”. The metal sword is too heavy, it can pass through a ghost and the ghost will never notice it. The paper sword is light and is not a real sword, like the ghost itself is not real, and that is why the paper sword of path of cessation of sufferings becomes an effective weapon against the ghost of sufferings; it belongs to a ghost’s world. The suffering and the path of the cessation of suffering are unreal, have no fixed essence, and that is why they can meet and sufferings can be defeated. To overcome the attachment to empty skandhas we need an empty understanding of the path; we need the overcoming of empty sufferings and empty causes of sufferings. If a path was something concrete and lead to tangible goals in practice then we would not be able to be in contact with suffering, because suffering and its causes are in the realm of the mind; and it is mind itself which gives birth to sufferings and goes through sufferings. We are able to conquer sufferings only by means of an empty “weapon”, a “weapon” which does not have any real basis, which is also constructed and part of the mind’s world. This is the meaning of “there is no path of cessation of sufferings”. The path is unsubstantial and that is why it makes us able to overcome other nonexistent things, like delusions. Our life is a dream of ignorance; and everything happens in our mind: sufferings take place in our mind and the path of cessation of sufferings – also happens in our mind. Before Prajnaparamita the main methods in Buddhism were listening, reflection and meditation. But the teaching of the Prajnaparamita changed the appearance of Buddhism in an essential way as it brought to it skillful methods of contemplation and energy exercises of yoga. This became possible because of a recognition of the effectiveness of applying illusory means. Later it made it possible for Buddhism to perceive methods of tantra, methods of proper visualization and to absorb other methods of skillful means, making Buddhism flexible and open to new teachings.